Happy Monday! 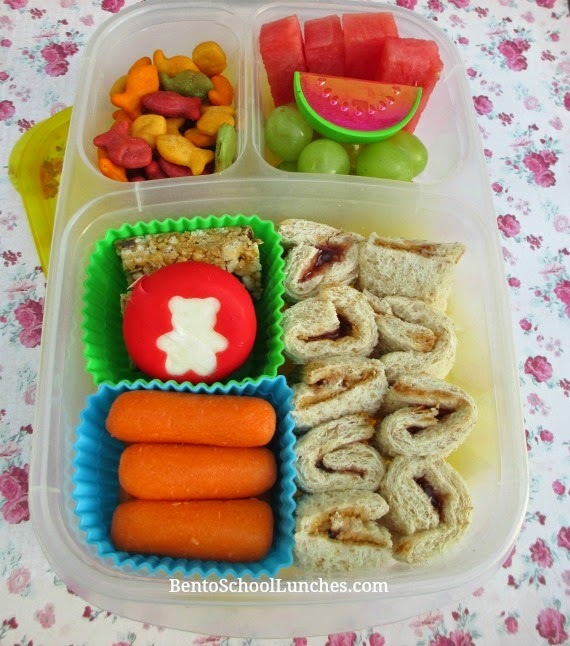 We made it through the first week of school even though there were some days when we had to rush, and a few times I had to quickly put a lunch together. This bento was one of them, and it took me around 10 minutes to put together. I added a little cuteness by using a bear shaped cookie cutter for the cheese cut out. This lunch is packed in an Easylunchboxes container. Sunbutter and jam roll ups sandwiches. I used a rolling pin to flatten the bread, spread the jam and sunbutter, roll and cut. Babybel cheese with a bear cut out, above granola bar. Watermelon and seedless green grapes with a watermelon cupcake pick. Look yummy and my daughter would love this! Really cute, and I love the bright colours of the cupcake pick!